Earlier this year Renegade Kid announced it is working on a new 2D platformer called Treasurenauts and said it hopes to release it into the 3DS eShop towards the end of this year. Co-founder of Renegade Kid Jools Watsham has been answering a few questions about it on Twitter and more information has been excavated as a result. He reiterated the developer's intention to release in 2013 rather than next year and said it hopes to port it over to other platforms, including Wii U and PlayStation Vita, in the future. However, when Treasurenauts does emerge it will not have an accompanying demo in the eShop, Watsham confirmed. 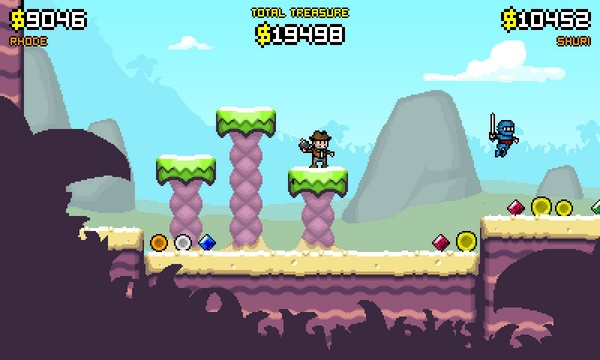 In terms of price, he believes it will be about the same as Mutant Mudds - $8.99 in North America. As we already know, the game supports download play and local multiplayer, while the campaign, which can be played alone or in co-op, has multiple endings that will add a great deal of longevity. Watsham has said we can expect a trailer for the upcoming release very soon, we can't wait to see it in action. Are you looking forward to Treasurenauts unearthing in the eShop? Let us know your thoughts on it in the comment section below. Price seems high but hopefully it will be just as long as Mutant Mudds plus the extra Co-op content. I am looking forward to it. Is there any new information about the FPS that Renegade Kid is working on? Sound's great. Now start praying so that Europe gets it before 2015. Really psyched over this one--I really hope it gets a nice Wii U port because it honestly seems more fitting to be on there to be honest. @feline2 Just curious, what didn't you like about Mutant Mudds? I'll be watching how it turns out but right now I'm on the fence, Mutant Mudds was a very big meh for me. Is it going to run at 60fps ? (With the controls done right this time). (I didn't bother with the demo for Mutant Mudds due it being so highly regarded and as I hated it so much I would have to know I was going to like it before I would buy anything from him again). Anything from Shi'en has been top quality that I have bought so I am more likely to give them the benefit of the doubt. Mutant Mudds, while a bit overrated IMO, was still a decent platformer, so I won't completely write this one off yet. I loved Mutant Mudds so this is on my radar. @Jools: I'm sure this game will rock. Be very proud my friend. Treasurenauts looks great. I trust RK with this type of game. For the record: I loved Mutant Mudds. It exudes a vibe that many gamers from the 80's and early 90's fondly remember and still enjoy. The music, level design, difficulty and simplicity are all points that gamers from the era love. I'd like to hear some news on Cult County too. I looooved Mutant Mudds. Can't wait.